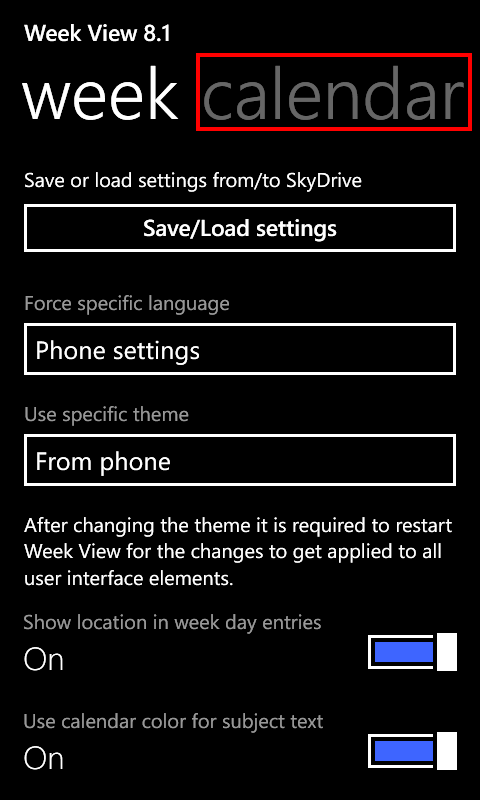 I guess most users know this but some „windows phone starters“ are not used to „pivot controls“. 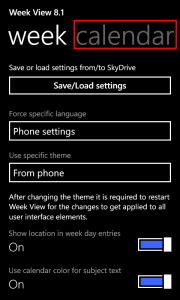 This is a control that contains more than 1 page, like the one that is used in the „settings“ of windows phone itself. 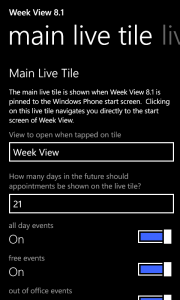 Week View contains more than 1 settings page too, you can go to „settings“ and swipe left/right to get to additional settings pages for ‚calendars‘, ’search options‘, ‚replacements‘, ‚main live tile‘ and more. 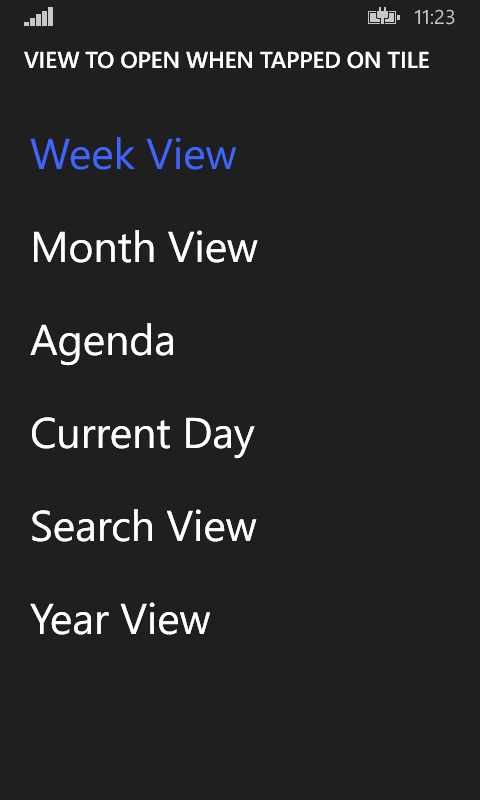 From the ‚week view‘, which is the default start view of the app – and also was the first one, that gave the app its name 3 years ago 😉 – you can go to a ‚details view‘ of the current day by simply tapping on a day or an event on a specific day. 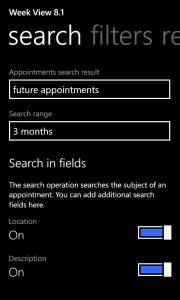 Once you are in this ‚details view‘, you can see all details of the selected appointment and also navigate to the next or previous day by swiping left/right. 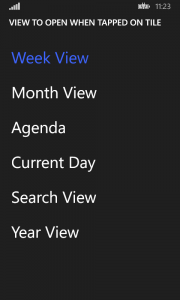 If you navigate forward some days and want to go to the week, of the current visible day, you can simply click on the caption on top of the page. This navigates you to the week of the current visible day. On the „replacements“ tab in the settings, you can define icons to replace parts of the subject text. 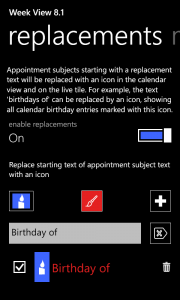 For example the subject „Birthday of John Doe“ can be replaced with an icon and the text „John Doe“. 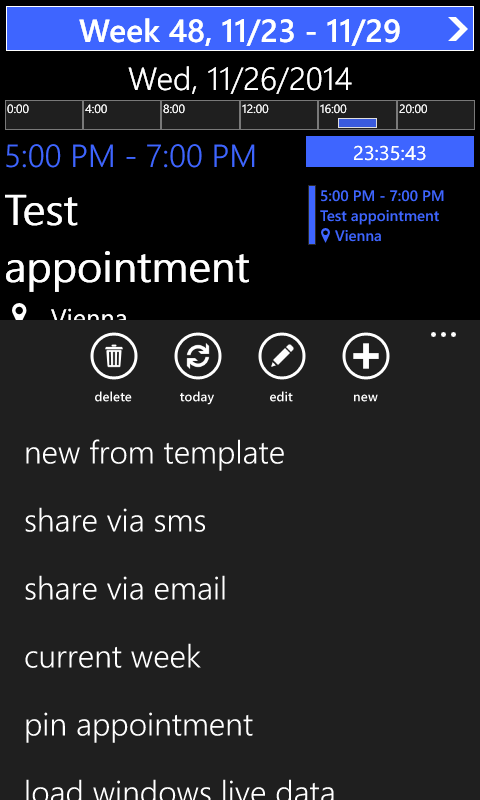 Additionally you can define a different colouring for a matching event. 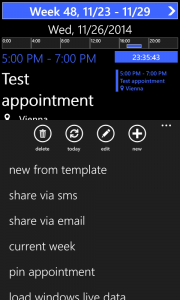 You do not need to select a replacement icon, you can just define a „match text“ and a colour. If you do not select a replacement Icon but enter „birthday“ to the text and define a red colour, all appointments that start with „birthday“ will be shown in red colour. If you select a replacement icon, the subject text will be replaced with the selected icon too. 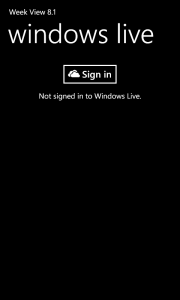 This replacement icon is used on the live tiles too. 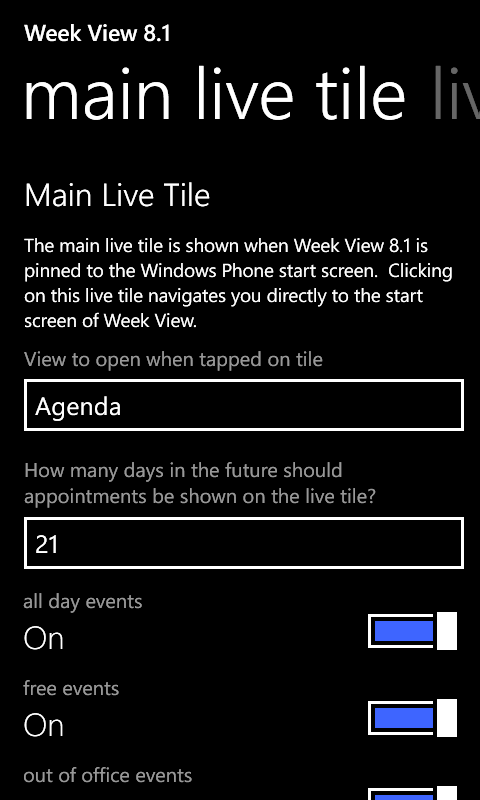 But this can be changed – for example, if you like to see an agenda-type of view (which no longer is available in the built in calendar), you can change this in the settings tab ‚main live tile‘. 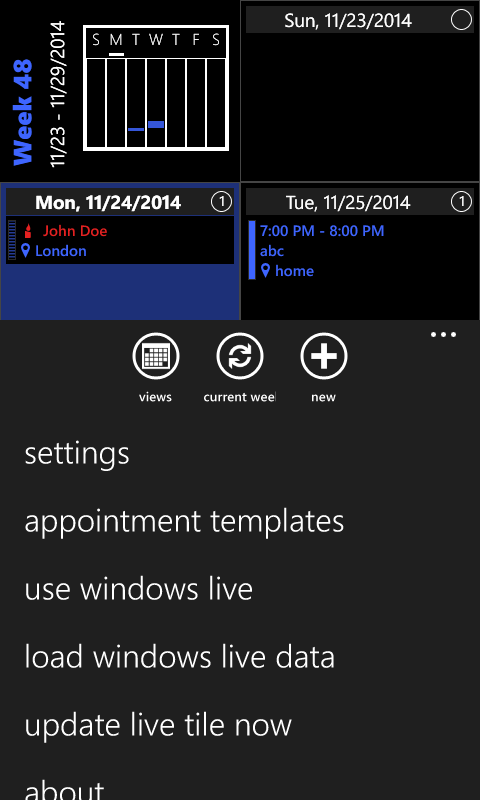 Here you can change the app start screen and you can set it to ‚agenda‘, if you like. 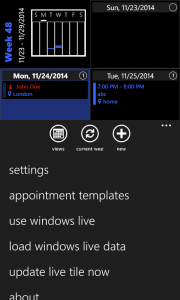 After you have done this, the app starts with the ‚agenda view‘. 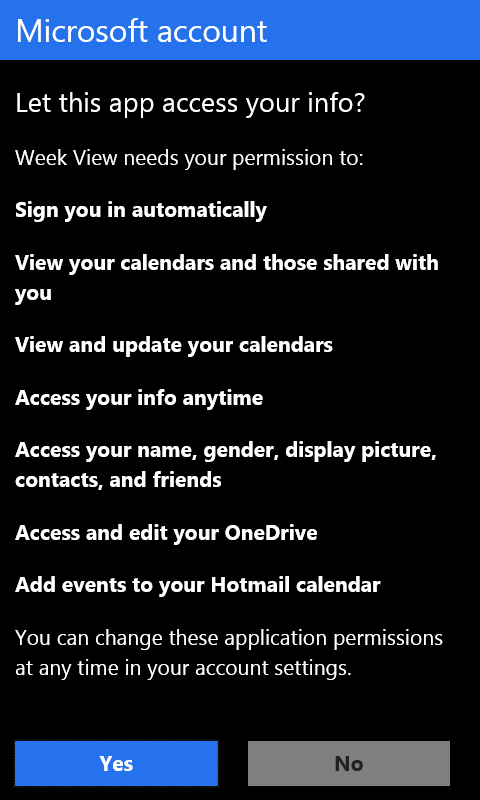 The built in windows phone calendar has a major limitation: appointments that were not created directly on the phone and are older than 2 weeks are „hidden“ automatically and there is no way to change this behaviour. 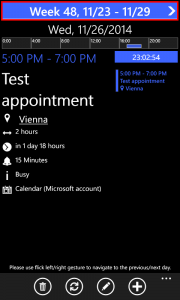 You can check this in the WP built in calendar. 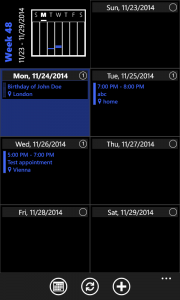 For appointments in windows live calendar, week view offers a workaround for this limitation. 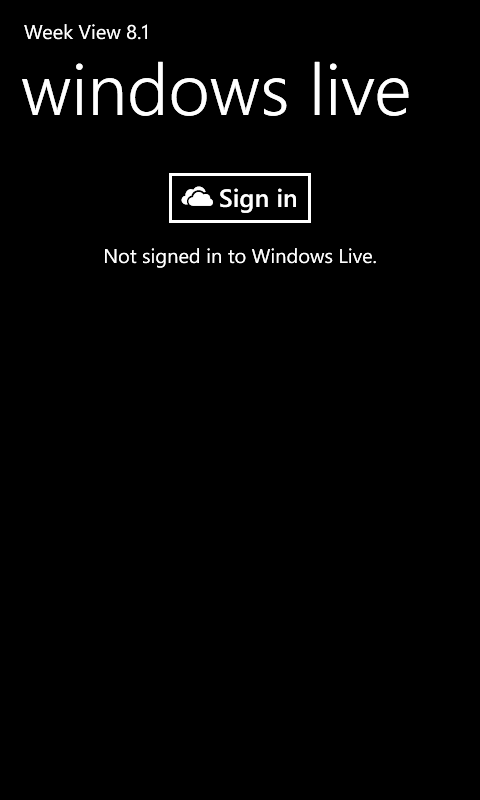 Hint: The app never gets access to your live id or password. 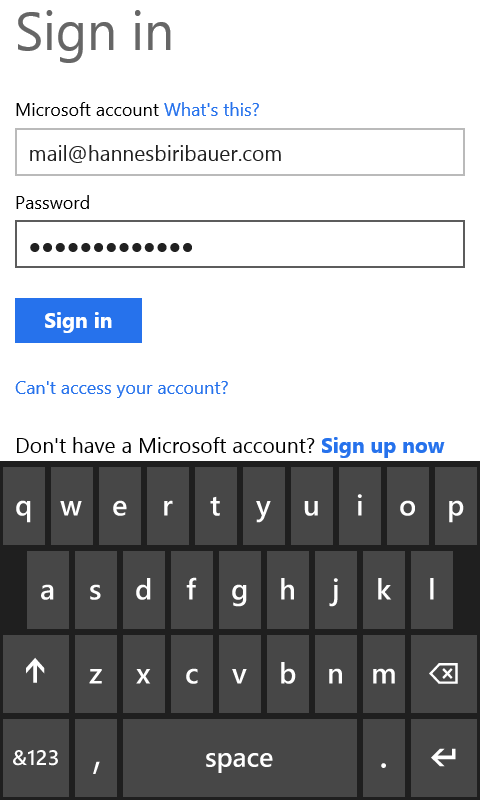 The login process is handled by Microsoft controls (that’s the reason why a web page is shown for the login dialog) that do not pass the entered live id or password to the app. 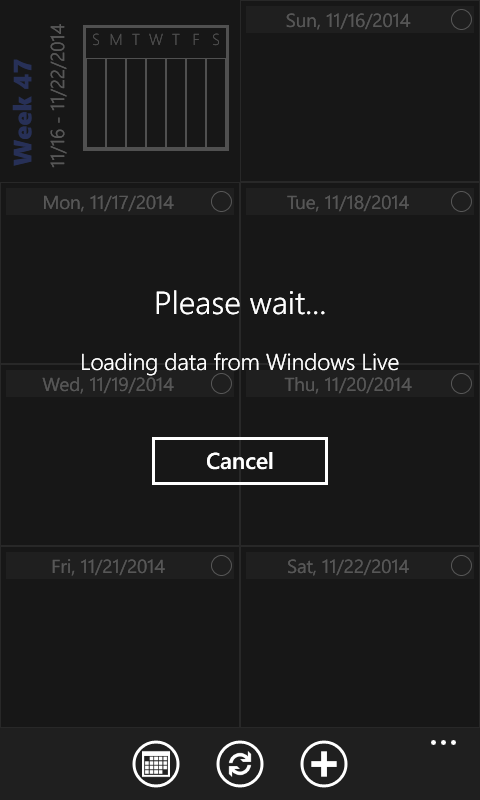 The app only gets a “token” that tells it that it’s allowed to load data from the windows live calendar. 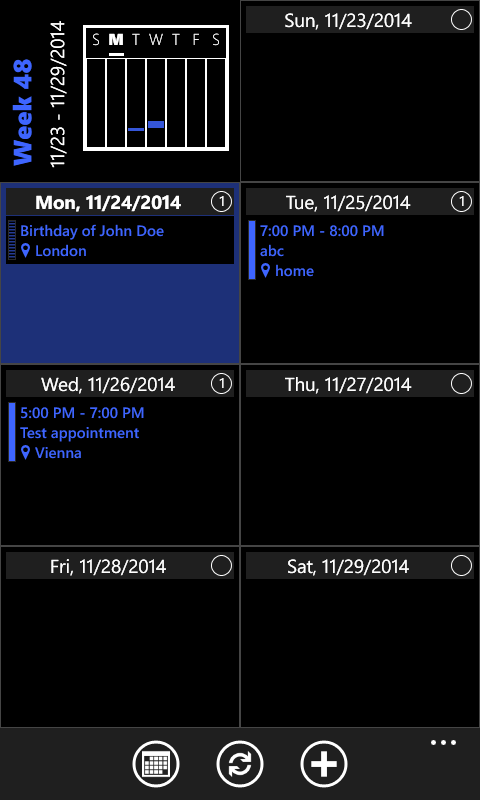 Don’t want to miss some birthday or another event, which is important to you? 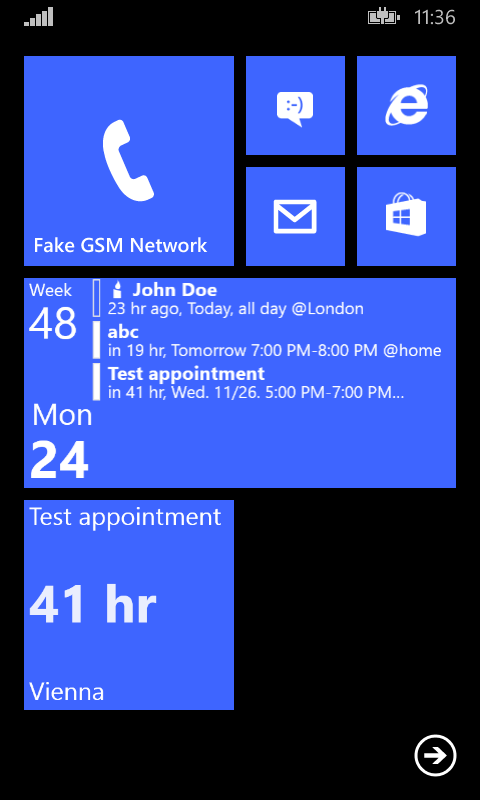 You don’t need a special „countdown timer app“, week view can do this. 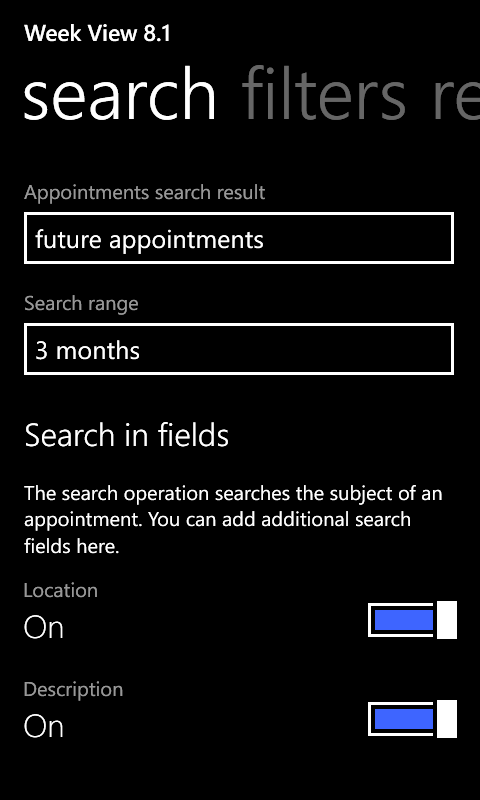 🙂 Just go to the details page of the appointment and select „pin appointment“ from the menu. 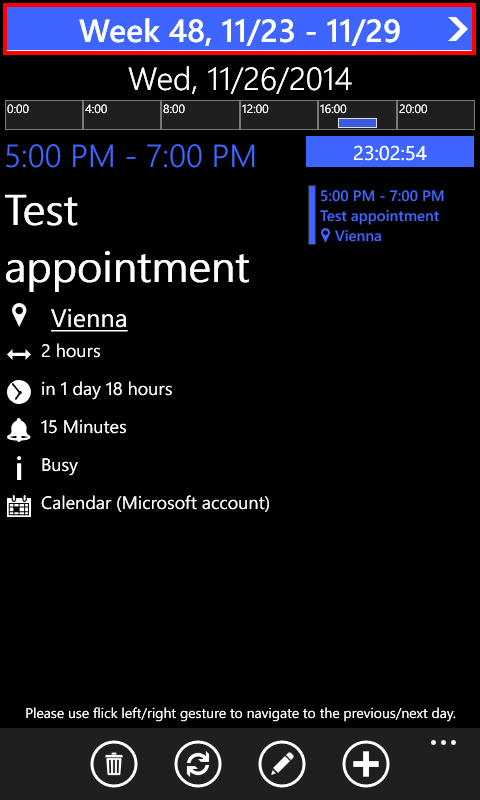 A live tile with the appointment subject and the time how long it takes until this appointment is placed on your start screen. 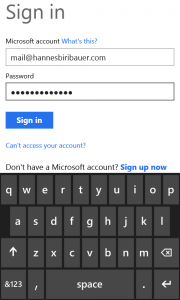 Klingeltöne können in den Einstellungen von Windows Phone selbst eingestellt werden – unabhängig von Apps. 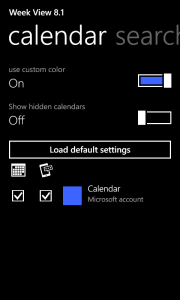 Bei mir werden nicht alle Geburtstage aus den Kontakten angezeigt, Neustart, löschen und neu eintragen des Geburtstags war auch nicht erfolgreich, benutze kein Windows live oder Google Kalender oder Exchange. Was kann man tun? Week View greift auf die Kontakte nicht zu sondern nur auf Kalender. 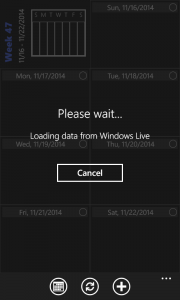 Geburtstage von Kontakten werden durch das OS automatisch in den Windows Live „Geburtstagskalender“ übernommen. 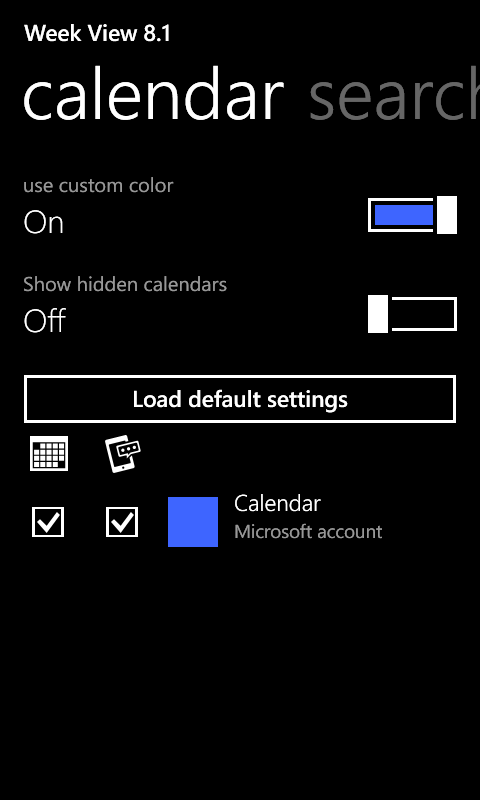 Sind die Geburtstage im WP internen Kalender sichtbar? 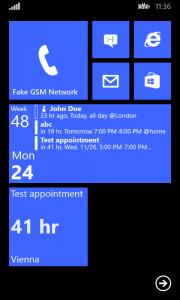 Week View verwendet die selbe Programmierschnittstelle.